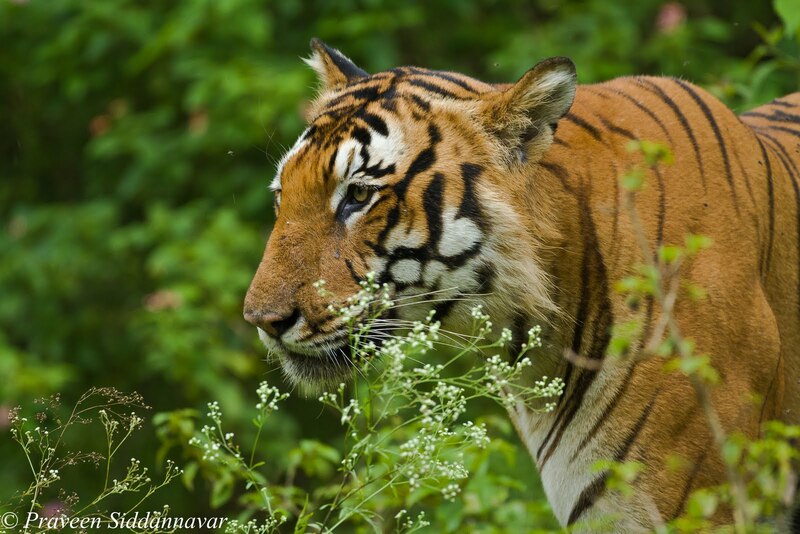 Praveen Siddannavar's Blog: The Prince of Bandipur! 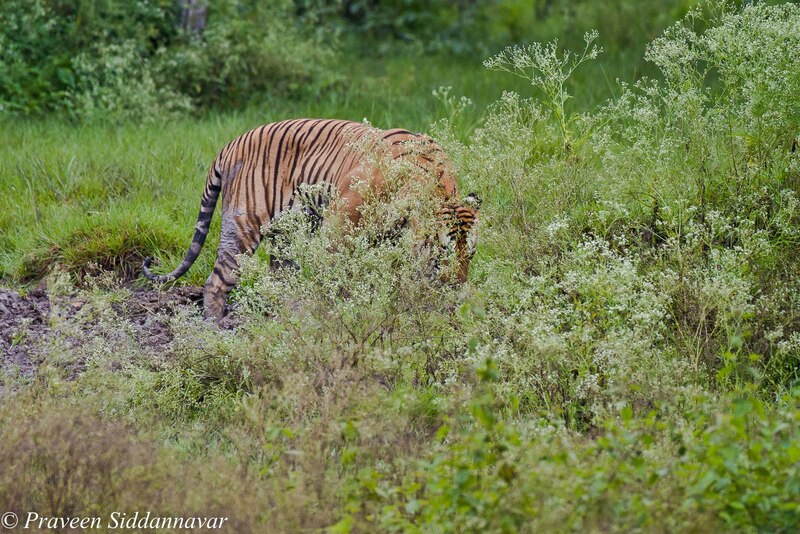 It has been almost 3 months that I had seen a Tiger at Bandipur Tiger Reserve. My last few visits to Bandipur from April’11 until June’11 have been dominated by Leopard sightings. 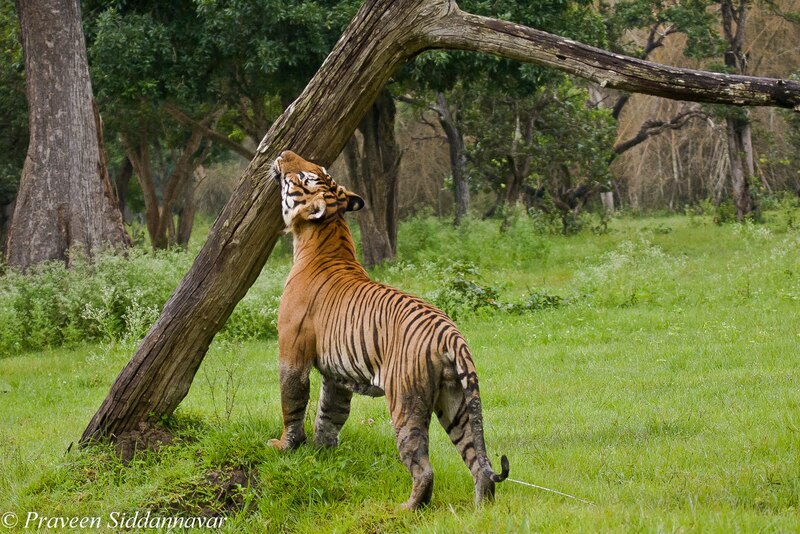 For some reasons the tiger sightings at Bandipur during the recent summers wasn’t that great. On 30th July’11 (Saturday) I decided to visit Bandipur, however I was alerted by my close associates & naturalist that the sightings have been really dull most of July. 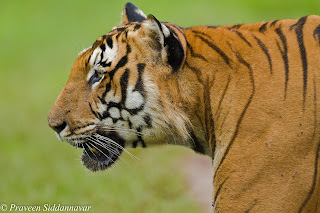 It was quite understandable and I was aware that the Bandipur National Park, especially the forest area had received heavy rains for past few weeks. However I had made up my mind to visit and try my luck. This time I had Pradeep who was driving the jeep; Pradeep is a young chap but has been in JLR for ages and knows the forest on his finger tips. We started our morning safari at 6:15am, after completing the formalities at Bandipur reception; we headed straight towards mulapura water hole. 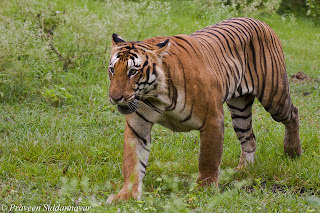 We were half the way when Pradeep noticed tiger pug marks and surprisingly there were also tiny pug marks, so it was quite evident that a tigress and her cubs had walked freely on the game track. I also admire the skills of spotting the pug marks by these drivers, who see it while in motion and stop to confirm. Most of them at JLR have done it time and again. Now to some extent even I have managed to pick up these skills. The pug marks were quite fresh and were leading in the opposite direction and not towards mulapura water hole. So we decided to turn back and follow the pug marks, as we reached the bettada katte junction the pug marks disappeared. This junction has 5 routes, on the right leads to surle katte, on the left bettada katte and the 2 straight routes finally reach the Bandipur-Ooty highway & of course one goes via arali katte. We decided to take the bettada katte route after driving up the hill for about 100 mts or more, we noticed few more pug marks of another tigress with cubs however even these pug marks were in opposite direction leading to bettada katte junction, so we turned back again and drove to the junction. We weren’t sure which route to choose to track these tigers; it seemed as if all these cats had a meeting at this junction. Note sure where they disappeared from this point. However we finally agreed to take the arali katte route, as this area is the territory of a tigress that has lost one eye, reasons unknown. As we were approaching arali katte we heard a Bonnet Macau (Red faced monkeys) alarm calls. We were excited as we had already seen the pug marks and now with alarm calls I was almost sure that we were close to a Tigress. We patiently waited for a while; few other jeeps also joined us. 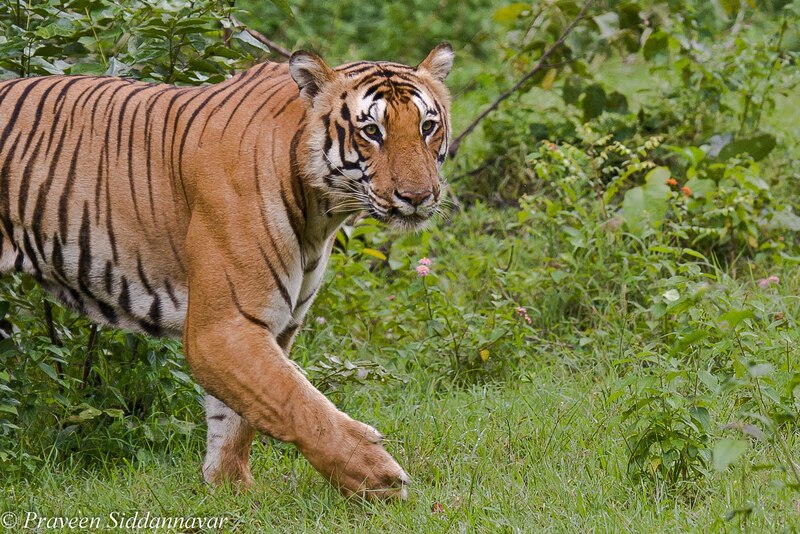 Mean while I met Sanjay - Naturalist at Country Club, Bandipur; he too waited along with us. After a while few jeeps moved away, however our jeep & Sanjay’s jeep waited patiently. 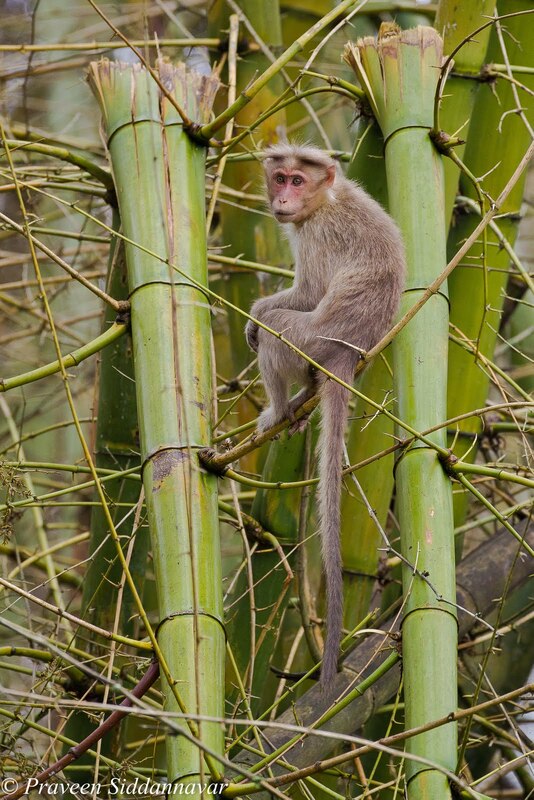 In the meantime we noticed that the monkeys were seen on a large bamboo tree and also the alarm calls had stopped. We weren’t sure what to do next; sometimes the alarm calls can also be a false one. We decided we will drive towards yere katte another water body; Sanjay’s jeep was ahead of us. As we approached the yere katte, I couldn’t believe my eyes, I spotted a huge male Tiger in the open; however his face was hid behind parthenium shrub. 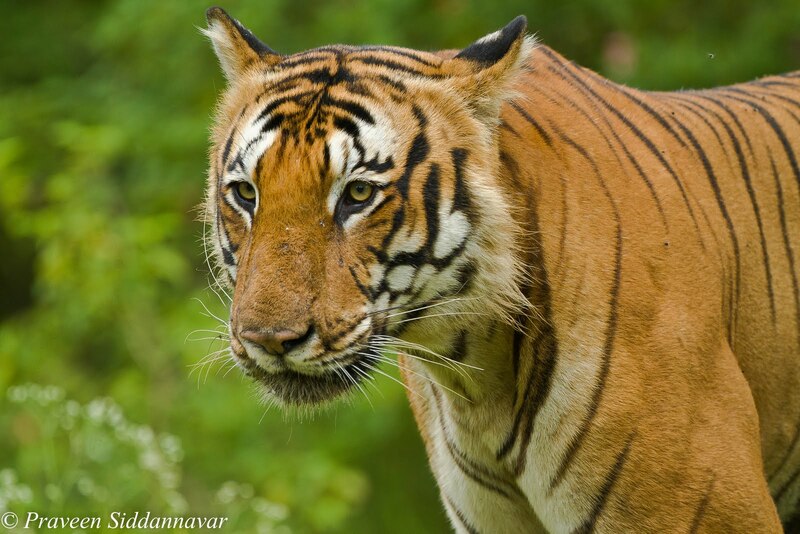 The tiger was on our right and I was seated as usual in the front seat next to Pradeep. My position wasn’t that great to shoot, I immediately rested my camera and lens on the roof top, by now the tiger started walking in our direction. I had an excellent angle to shoot so I fired few shots. Within minutes I realized that accidentally my shutter speed is 1/8000 sec, this was a serious error. My program setting knob had got changed to Tv mode (Shutter Speed mode), I had set my camera to Av mode that is aperture. 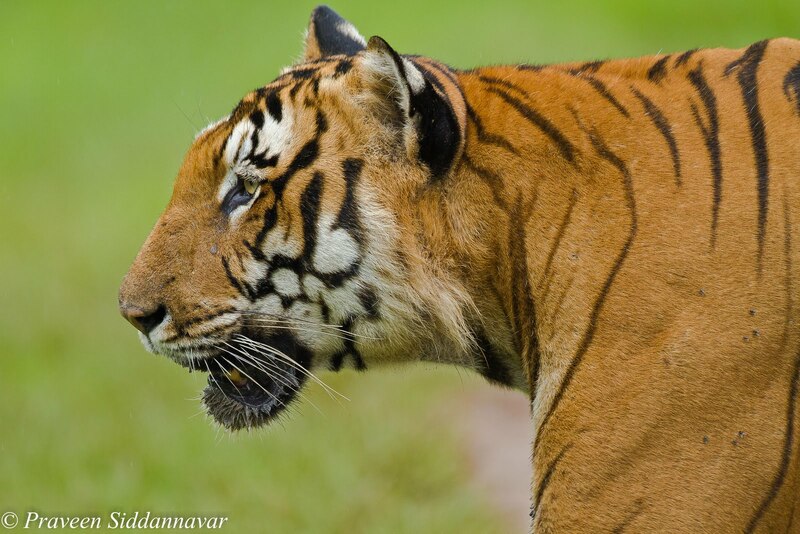 About 15-20 images that I shot of the Tiger walking in our direction with superb eye contact all got heavily under-exposed. I was really put off; the only good thing was I realized the error quite fast. Later I had to shuffle between my other camera that is Canon 40D with 100-400mm lens and the 7D with 500mm, since the tiger was getting really close to our jeep. 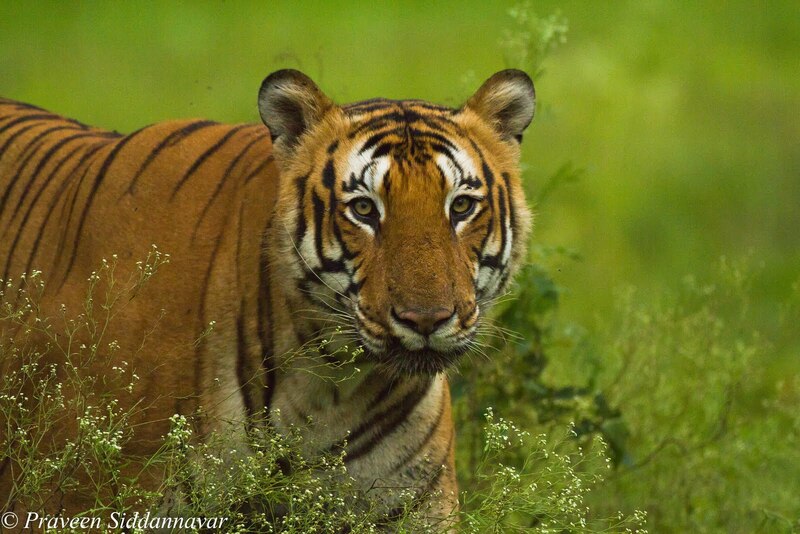 Now the tiger got so close hardly few feet away from our jeep & I somehow managed to click using both equipments. 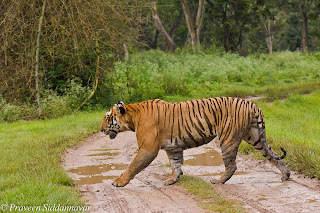 One image that I was eager to click was when this tiger was crossing the game track right in front of us. With on and off rains, the slushy water clogged track, greens surrounding, freshness of the forest, what a sight this was. Simply Beautiful! The majestic walk by this huge male tiger, not caring about human presence & the jeep in front, he seemed totally fearless. He then went and sniffed a dry tree trunk to check his scent marking; the forest was at its best with lush greens all over and to add a tiger in the open, you can’t ask for more. What a perfect setting for any wildlife photographer. By now I recognized this tiger; he is Agastya’s son (one of the oldest male tigers of Bandipur ~ aged 15 years old). This guy could be aged about 5 years; I have seen him before as well at bettada katte. 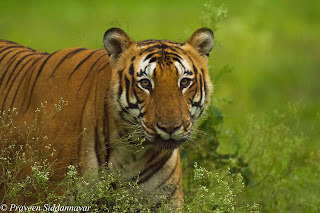 I consider him to be the most bold, handsome tigers and surely he is “The Prince of Bandipur” who will rule this forest. Later he crossed the game track & then disappeared in the bushes, after having seen him for over 20 minutes. We all wanted more; no wonder tigers are the most beautiful creations by God on Earth. 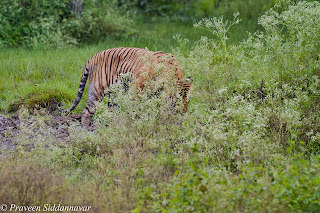 Again this sighting was dream come true as I had the tiger at unbelievable close distance. I also believe that monsoons are the best seasons from photography point of view, and yet again it proved right this time. Hi, very nice and well written post with beautiful picture. I have visited this place once, had a great time at this place with family. Thanks for sharing this. This really helps people to plan for trips during vacation or weekend. If anyone planning to visit this place by bus then book bus tickets in Online Bus Ticket Booking portal to enjoy the trip.